With phase one over, the Victoria Park Community League turned its attention to the cup for the next couple of weeks. Monday saw just three-first round matches as Ex-Pats secured a narrow victory over Mad Marrocas on pitch 2. Opting to bat first, Ex-Pats struck an imposing 167-4, thanks to impressive batting from Alex Hickson (50) and Stu Campbell (51). Mad Marrocas kept up with the run rate and looked in good shape thanks to Jamie Cox (52). As they needed eleven off the last over, before Trent Bryne took 1-4 to deny them victory. Two cup-only teams, Government Actuaries Department and NMCC, met on pitch 1. GADC struck a tricky166-3. Owen Dimbylow (52) and Alan Dorn (36) among the run scorers. In response NMCC fell 36 runs short finishing on 130-6, despite a spirited knock from Ed Wylde (53). Jack Errington taking 4-26 for GADC. London Fields posted a confident 154-3 against Pacific, who fell 49 runs short in their response, bowled out for 105. The second round kicked off on Tuesday, which saw the unusual feat of just one wicket falling in the entire match on pitch 2. Old Fallopians 2nd XII smashed an impressive 184-0. Top three Freddie Barrass (53), Matt Wake (50) and Samsuddin Tipu (50) looked supremely unmovable. In response Best Nationals batted aptly but fell short of the run rate, despite a good innings from Suraj (50). Raj being the only batsmen to fall for 21 as Best Nationals finished on 146-1. Mile Tailenders saw off Crossrail in a tight match on pitch 3. Crossrail struck 155-5 with impressive batting from openers Taylor (48) and Edward Hamlyn (54). Tailenders kept their heads with Sanj Gunewaradene retiring on 50 and some confident batting from skipper John Speakman (31) as they chased down their target with just four balls to spare. Victoria Lounge eased past newcomers Evans Music on pitch 1. Evans completed their allotted overs on 90-5. With Victoria Lounge eased home and earning an early drink with five overs remaining, losing just three wickets. Ex-Pats returned to the field against Regents on Wednesday. Batting first, Regents posted a competitive 127-6. Mark Partridge top scoring with 50 and a valuable contribution from David Campbell (30). Ex-Pats looked to be coasting thanks to Trent Byrne’s early striking but after his dismissal (34), things spiralled and despite a slogging 28 from Reston Gimpel, Ex-Pats fell 12 runs short bowled out for 115. On Pitch 3, Camel Lights looked in good nick against Homerton. Thanks to 49 from opener and skipper Tom Porter and some late blasting from Rich Haagen (45) as Camel posted 152-4. Despite a spirited knick of 31 from opener Lorenzo de Glossop, Homerton fell well short, bowled out for 57. 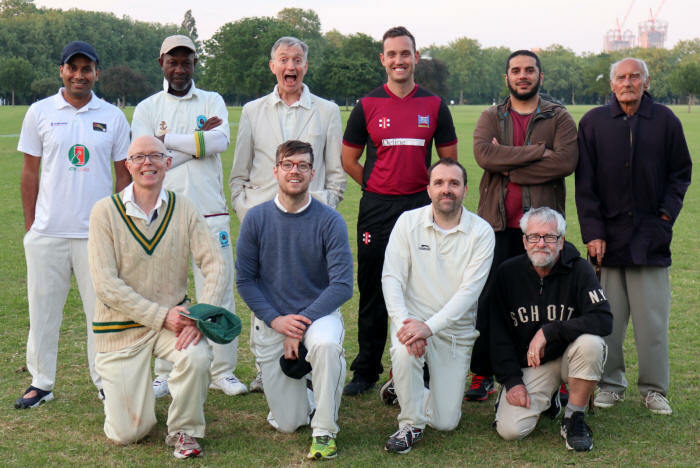 Thursday saw Mashia score a hefty 175-3 against London Fields. Rahil Shahzad (51) and Stuart Miller (24) top scoring. Despite a valiant reply, LF fell 35 runs short ending on 135-6.